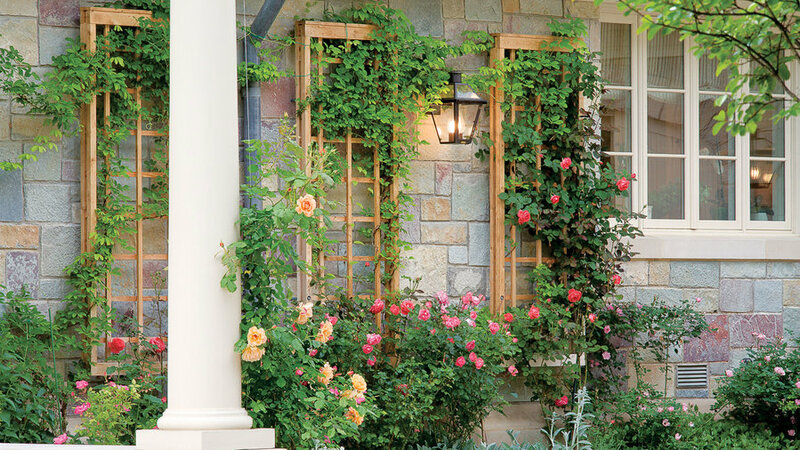 This tall, wall-attached trellis panel is elegantly simple. You may want to build several and space them one panel’s width apart,. For a trellis like this, the exact dimensions of the pieces can make a big difference in the overall appearance. We show lattice that is ¾ inch thick and 11⁄8 inches wide. You could use standard 1 by 2s, which are ¾ inch by 1½ inches, but the result would be surprisingly clunky-looking. Rip-cutting the slats will take only a half hour or so. There are no half-lap joints, so this project can be built quickly. Start by rip-cutting the lattice slats and frame pieces. Because the trellis will be attached to the house, the frame need not be very strong and can be assembled with a single screw at each joint. Since both vertical and horizontal pieces run around the perimeter of the lattice, the frame can be simply attached.